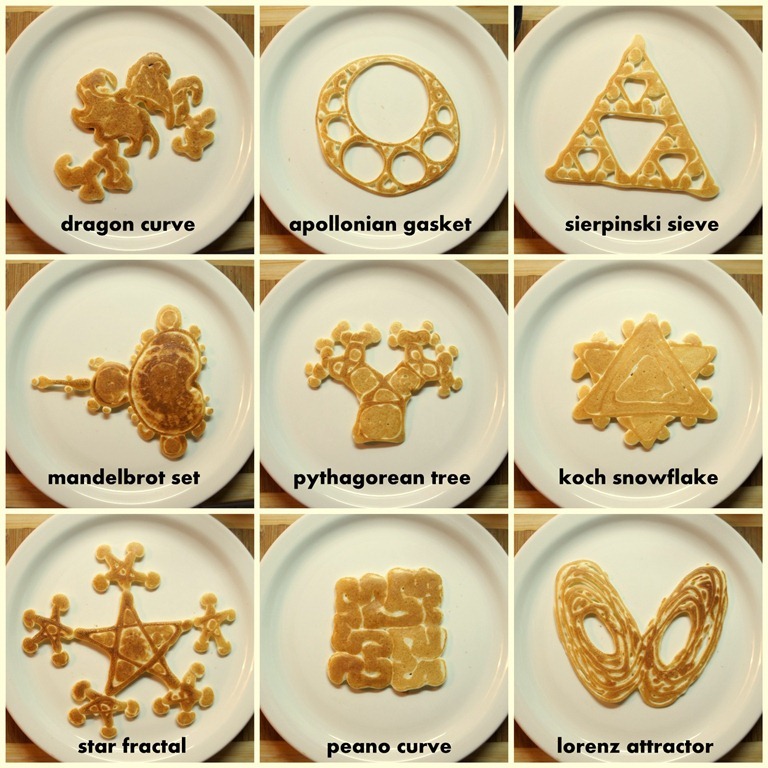 How would one make mathematical cuisine? Not just food that looks mathematical (like math cookies), but something that you truly have to eat and taste in order to experience its mathematical nature. 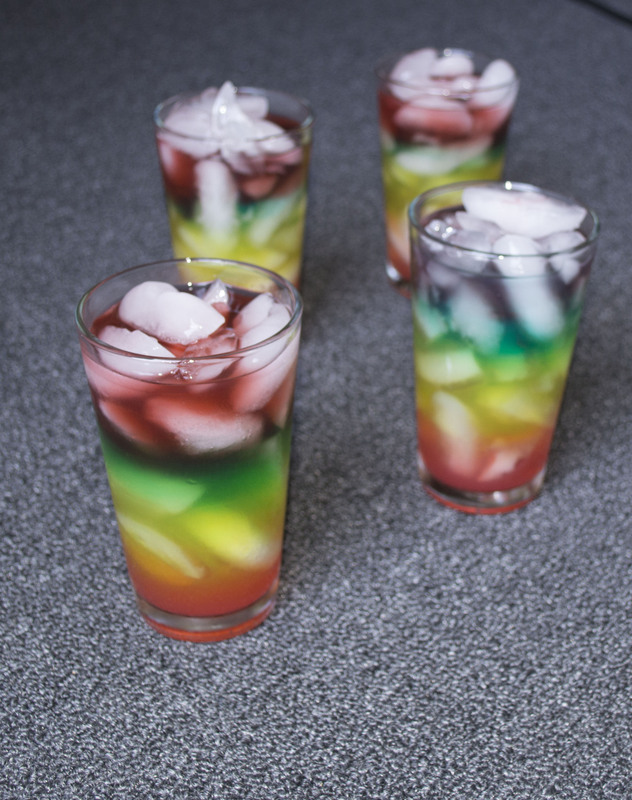 Not just any layered drinks, of course. In our layered lemonade, the intensity of flavors as you go down the layers increases exponentially. The sugar and lemon juice proportions for the same quantity of liquid increase according to the Fibonacci sequence. The sweeter layers are denser and naturally keep separated lower down. Indeed, the nature of layered drinks is that they are monotonically increasing in sweetness (and/or decreasing in alcohol). 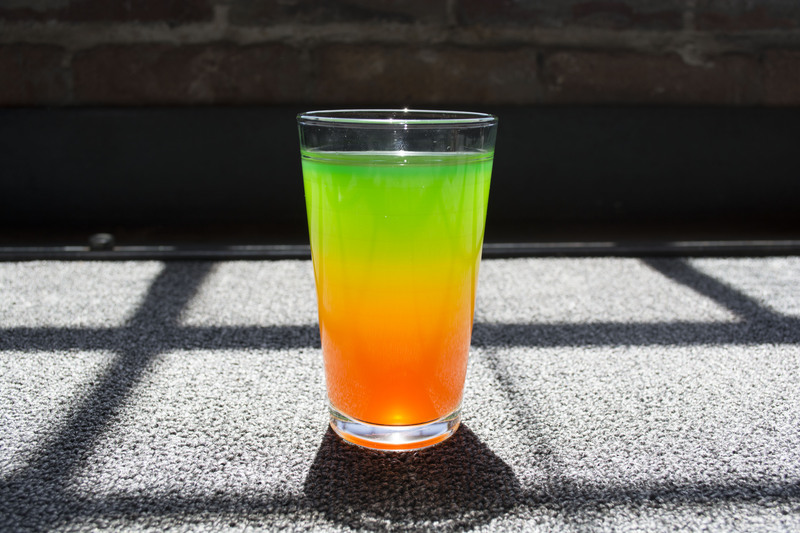 Thus, there is an intrinsic mathematical property to all layered drinks. Additionally, the ratio of sugar to lemon juice in our lemonade isn’t constant. The top layer of our drink is 1 part lemon, while the second layer is 1 part sugar syrup. Following the Fibonacci rule, each subsequent layer has proportions that are the sum of the previous two layers proportions. Layer 3 is 1 part lemon, 1 part sugar. Layer 4 is 1 part lemon, 2 parts sugar, and so on. Generically, for layer n > 2, there are fib(n-1) parts sugar and fib(n-2) parts lemon juice. These are adjacent Fibonacci numbers, so as the drink is consumed the ratio of lemon to sugar approximates the Golden Ratio. This drink may be the worlds first tastable example of the relationship between the Fibonacci sequence and the golden ratio! Surprisingly, using golden ratio relative proportions of lemon juice and simple syrup actually seems to make rather good lemonade. When consumed, the beverage starts out fairly flavorless, then rapidly ramps up. It also alternates between being a bit sweet to being slightly sour (of course this is a matter of personal taste), as the approximation of the golden ratio alternates between being slightly high and slightly low. You too can make Fibonacci lemonade and experience the taste of exponential flavor, the golden ratio, and the Fibonacci sequence. Just follow the recipe below! You must start with the sweetest and densest layer and work your way backwards up the drink. 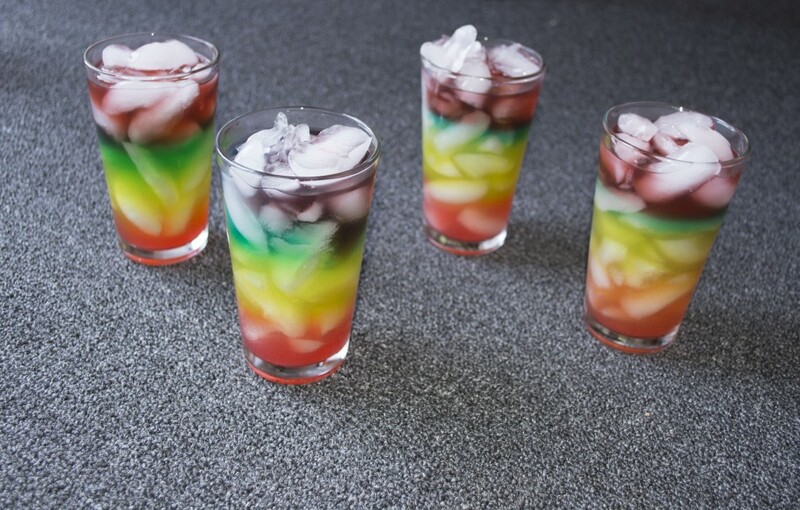 I describe the layers for a 7 layer drink below, although you may choose to make a different number of layers to start. 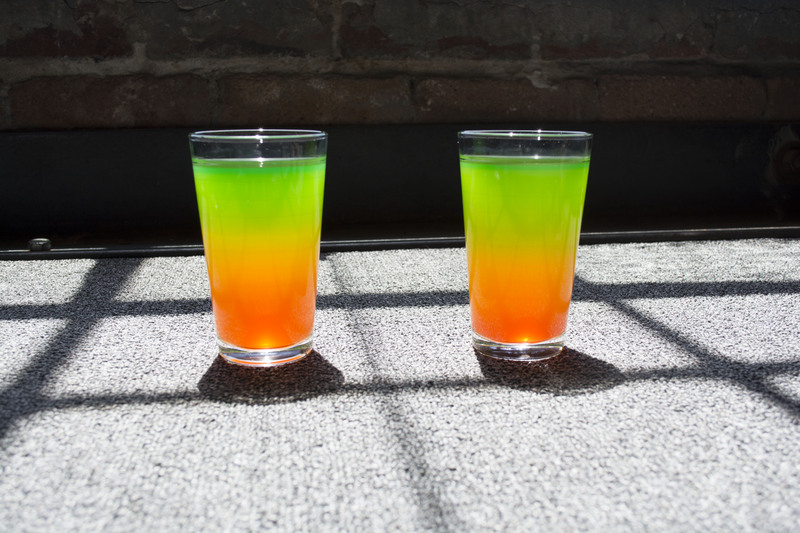 The drink could also be made without the first layer, in which case it is neatly just two offset increasing Fibonacci sequences, one per ingredient. First, fill your glasses with ice. 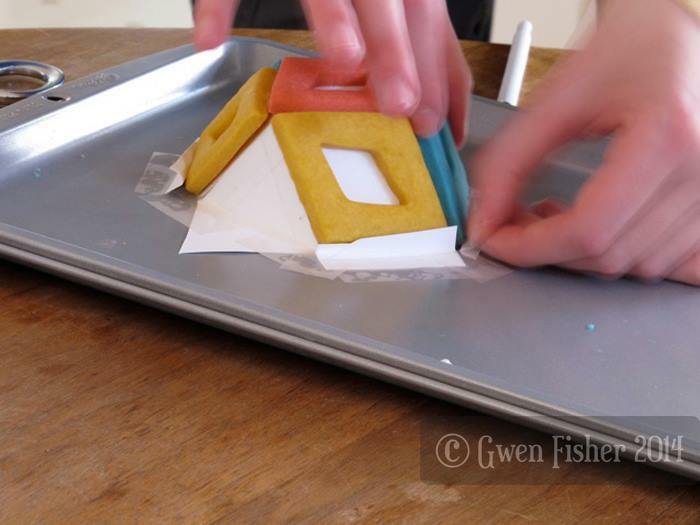 Then, do the following steps for each layer. Finally, sip your mathematical masterpiece. Add the proportions of lemon juice and simple syrup indicated below to your liquid measuring cup. Fill measuring cup to the 4 oz. (1/2 cup) line. Stir to blend all ingredients in your measuring cup. Many simple syrups are 2 parts sugar to 1 part water. If yours is like this, halve the amount of sugar you are using (or it will probably be far too sweet). For a more authentic, less watered down experience, you need to make your drinks without ice. This is much harder, and I don’t actually recommend it unless you are patient or really know what you are doing. You can find directions for layering without ice here. 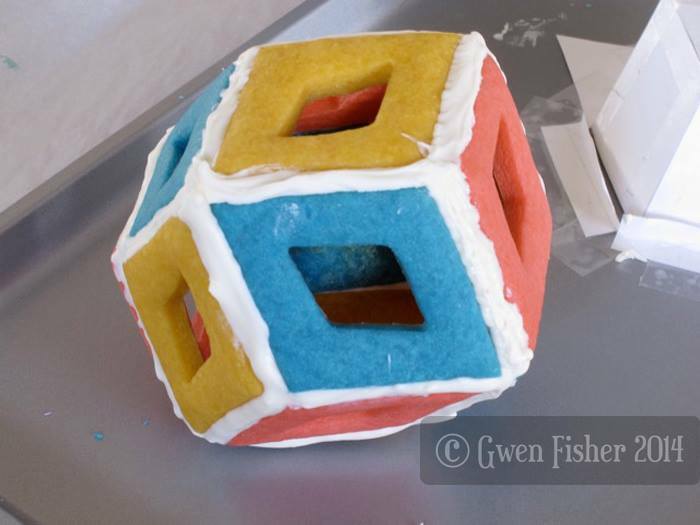 This entry was posted in Food, Life, Math Art, Recreational Math and tagged food, math art on June 4, 2014 by hawksley. Vi made a video about the our cookie making adventures, in which she proves that I have some pretty amazing friends. Enjoy! 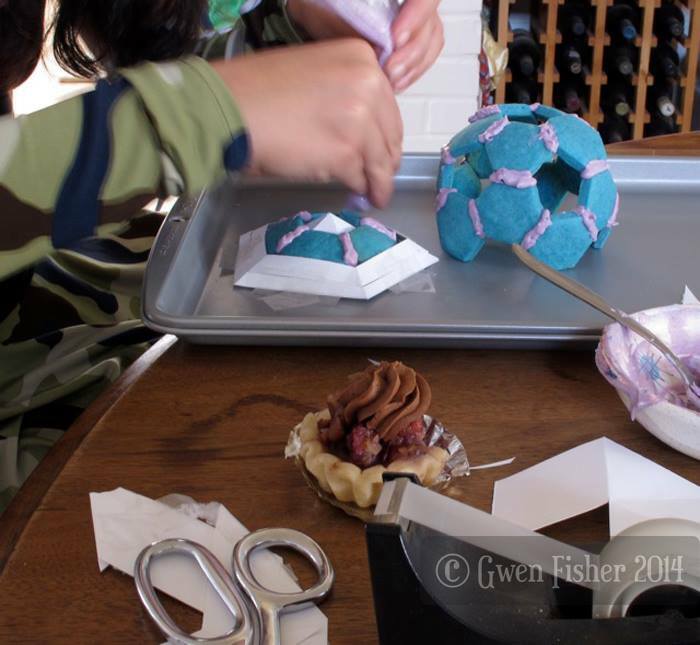 Update: She also made this blog post about her process. 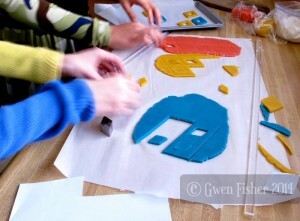 Gwen’s blog post about our cookie making is here. 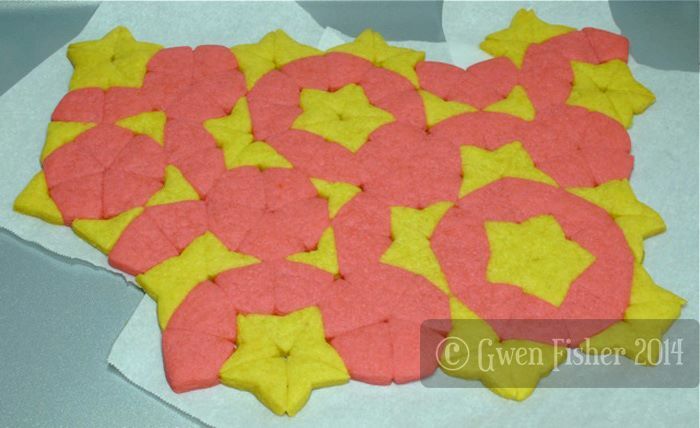 This entry was posted in Food, Math Art, Recreational Math and tagged food, math art on March 3, 2014 by hawksley. 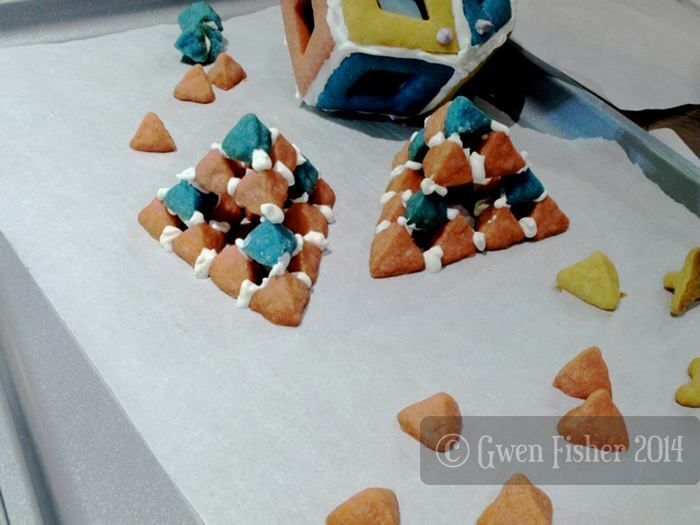 What happens when you combine three recreational math artists with a fantastic pastry chef? 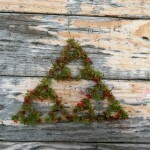 Last weekend, Vi Hart, Gwen Fisher, Ruth Fisher and I got together to try this experiment. 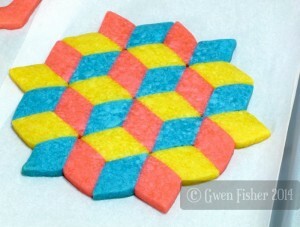 Ruth provided several colors of shortbread dough and white chocolate “glue” and a few assorted cookie cutters. Gwen took photos (shown with permission below) and Vi took a bunch of video. 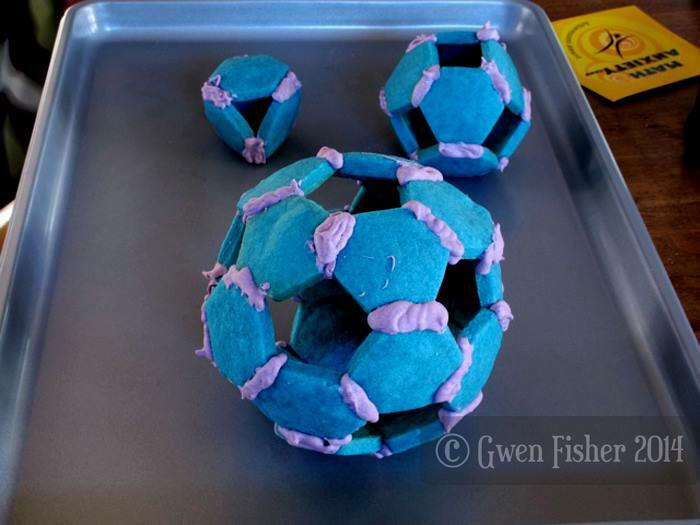 Our first idea was to make polyhedra cookies. 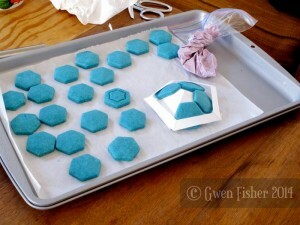 The hexagon cookie cutter seemed to suggest truncated tetrahedra, octahedra, and icosahedra. We tried making one of each. Assembly was a bit tricky and required the use of an assortment of cardboard jigs to keep pieces in place while the chocolate dried. While our hexagon cookies were baking, Vi got started making a rhombic dodecahedron. We used a straight-edge to cut rhombi with the correct dimensions. 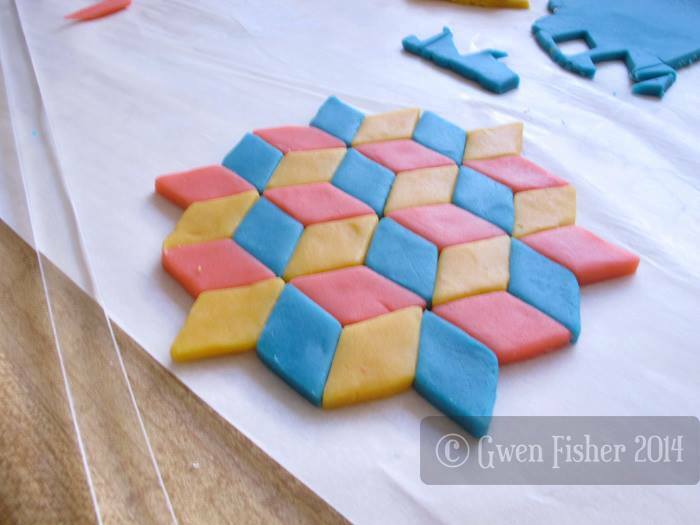 She wanted to have little cut-out holes in her polyhedron, and used a rhombic cookie cutter that happened to have just the correct dimensions to tile the plane nicely. Which, of course, got us thinking about more interesting geometric tilings. For example, non-periodic Penrose tilings. Everyone likes the kite dart tiling and we made ourselves some cookie cutters out of card stock to generate kites and darts quickly. and some shortbread “shortbraids”. The three rings here form an 18-crossing Brunnian link. This entry was posted in Food, Life, Math Art, Projects and tagged food, math art on February 3, 2014 by hawksley. are so much fun to make that they have shown up in this blog before! Here are a couple fun ones that I have made recently. The first one gives you a sense of just how many strawberries I ate on my last strawberry picking trip. 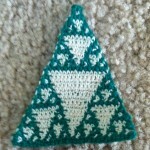 The second one was made with thread crochet. 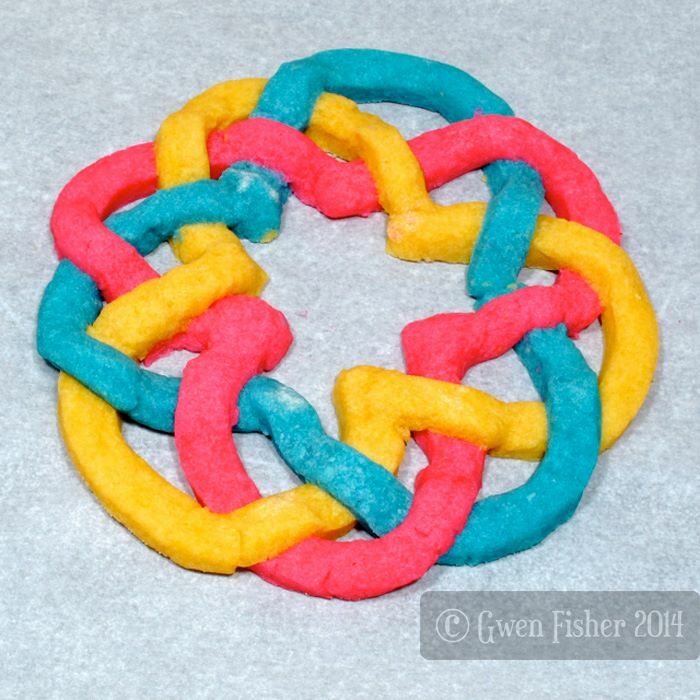 This entry was posted in Food, Knots, Life, Math Art and tagged crochet, food, fractals, geometry, knots, project on April 16, 2012 by hawksley.